The example is made in an Aran weight acrylic yarn, so measurements and yarn requirements are given for that, but the blanket can be made an any weight yarn. Use hook appropriate to yarn weight. There is a chart of the first 13 rounds available here. Rnd 2: Ch 3, 1 dc in same st, 2 dc in each st around (24 dc). Join with sl st in third ch. Rnd 3: Ch 3, 1 dc in same st, 2 dc in each st around (48 dc). Join with sl st in third ch. Rnd 4: Sl st in space between beginning chain of rnd 3 and next dc. Ch 3 and dc in same space. Skip 2 dc, (dc, ch1, dc) in space between dc. Repeat the following for the round: skip 2 dc, 2dc in space between dc, skip 2 dc, (dc, ch1, dc) in space between dc (12 2dc clusters, 12 v-stitches). Join with sl st in third ch. Rnd 5: Sl st in space between beginning chain of rnd 4 and next dc. Ch 4 and dc in same space. Skip 2 dc, (dc, ch1,dc) in ch sp. Repeat the following for the round: skip 2 dc, (dc, ch1, dc) in space between dc, skip 2 dc, (dc, ch1, dc) in ch sp (24 v-stitches). Join with sl st in third ch. Rnd 6: Sl st in ch sp. Ch 4 and dc in same space. Skip 2 dc, (dc, ch2, dc) in ch sp. Repeat the following for the round: skip 2 dc, (dc, ch1, dc) in ch sp, skip 2 dc, (dc, ch2, dc) in ch sp (12 1ch-v-stitches, 12 2ch-v-stitches). Join with sl st in third ch. Rnd 7: Sl st in ch sp. Ch 5 and dc in same space. Skip 2 dc, (2dc, ch1, 2dc) in ch sp. Repeat the following for the round: skip 2 dc, (dc, ch2, dc) in ch sp, skip 2 dc, (2dc, ch1, 2dc) in ch sp (12 v-stitches, 12 shells). Join with sl st in third ch. Rnd 8: Sl st in ch sp. Ch 3 and 2dc, ch1, 3dc in same space. Skip 3 dc, (dc, ch2, dc) in ch sp. Repeat the following for the round: skip 3 dc, (3dc, ch1, 3dc) in ch sp, skip 3 dc, (dc, ch2, dc) in ch sp (12 shells, 12 v-stitches). Join with sl st in third ch. Rnd 9: Sl st in 2 dc, sl st in ch sp. Ch 5 and dc in same space. Skip 4 dc, (3dc, ch1, 3dc) in ch sp, skip 4 dc, (dc, ch2, dc) in ch sp, skip 4 dc, (3dc, ch1, 3dc) in ch sp, ch 1, skip 1 dc, in space between v-stitch and shell, work 2 dc, ch 2. Repeat the following for the round: skip 3 dc, (dc, ch2, dc) in ch sp, skip 4 dc, (3dc, ch1, 3dc) in ch sp, skip 4 dc, (dc, ch2, dc) in ch sp, skip 4 dc, (3dc, ch1, 3dc) in ch sp, ch 1, skip 1 dc, in space between v-stitch and shell, work 2 dc, ch 2. Join with sl st in third ch. Rnd 10: Sl st in ch sp. Ch 3 and 2dc, ch1, 3dc in same space. Skip 4 dc, (dc, ch2, dc) in ch sp, skip 4 dc, (3dc, ch1, 3dc) in ch sp, skip 4 dc, (dc, ch2, dc) in ch sp, ch2, skip 4 dc, in space between dc work (dc, ch2, dc), ch1. Repeat the following for the round: skip 2 dc, (3dc, ch1, 3dc) in ch sp, skip 4 dc, (dc, ch2, dc) in ch sp, skip 4 dc, (3dc, ch1, 3dc) in ch sp, skip 4 dc, (dc, ch2, dc) in ch sp, ch 2, skip 4 dc, in space between dc work (dc, ch2, dc), ch1. Join with sl st in third ch. Rnd 11: Sl st in 2 dc, sl st in ch sp. Ch 5 and dc in same space. Skip 4 dc, (3dc, ch1, 3dc) in ch sp, skip 4 dc, (dc, ch2, dc) in ch sp, skip 4 dc, (3dc, ch1, 3dc) in ch sp, ch 1, skip 2 dc, in ch sp work (2dc, ch2, 2dc), ch 2. Repeat the following for the round: skip 4 dc, (dc, ch2, dc) in ch sp, skip 4 dc, (3dc, ch1, 3dc) in ch sp, skip 4 dc, (dc, ch2, dc) in ch sp, skip 4 dc, (3dc, ch1, 3dc) in ch sp, ch 1, skip 2 dc, in ch sp work (2dc, ch2, 2dc), ch 2. Join with sl st in third ch. Rnd 12: Sl st in ch sp. Ch 3 and 2dc, ch1, 3dc in same space. Skip 4 dc, (dc, ch2, dc) in ch sp, skip 4 dc, (3dc, ch1, 3dc) in ch sp, skip 4 dc, (dc, ch2, dc) in ch sp, ch 2, skip 4 dc, dc in next dc, in ch sp work (2dc, ch2, 2dc), dc in next dc, ch 1. Repeat the following for the round: skip 2 dc, (3dc, ch1, 3dc) in ch sp, skip 4 dc, (dc, ch2, dc) in ch sp, skip 4 dc, (3dc, ch1, 3dc) in ch sp, skip 4 dc, (dc, ch2, dc) in ch sp, ch 2, skip 4 dc, dc in next dc, in ch sp work (2dc, ch2, 2dc), dc in next dc, ch 1. Join with sl st in third ch. Rnd 13: Sl st in 2 dc, sl st in ch sp. Ch 5 and dc in same space. Skip 4 dc, (3dc, ch1, 3dc) in ch sp, skip 4 dc, (dc, ch2, dc) in ch sp, skip 4 dc, (3dc, ch1, 3dc) in ch sp, ch 1, skip 2 dc, dc in next 2dc, in ch sp work (2dc, ch2, 2dc), dc in next 2dc, ch 2. Repeat the following for the round: skip 4 dc, (dc, ch2, dc) in ch sp, skip 4 dc, (3dc, ch1, 3dc) in ch sp, skip 4 dc, (dc, ch2, dc) in ch sp, skip 4 dc, (3dc, ch1, 3dc) in ch sp, ch 1, skip 2 dc, dc in next 2dc, in ch sp work (2dc, ch2, 2dc), dc in next 2dc, ch 2. Join with sl st in third ch. Rnd 14: Sl st in ch sp. Ch 3 and 2dc, ch1, 3dc in same space. Skip 4 dc, (dc, ch2, dc) in ch sp, skip 4 dc, (3dc, ch1, 3dc) in ch sp, skip 4 dc, (dc, ch2, dc) in ch sp, ch 2, skip 4 dc, dc in each dc up to the ch sp, in ch sp work (2dc, ch2, 2dc), dc in each dc up to the last dc before ch sp, ch 1. Repeat the following for the round: skip 2 dc, (3dc, ch1, 3dc) in ch sp, skip 4 dc, (dc, ch2, dc) in ch sp, skip 4 dc, (3dc, ch1, 3dc) in ch sp, skip 4 dc, (dc, ch2, dc) in ch sp, ch 2, skip 4 dc, dc in each dc up to the ch sp, in ch sp work (2dc, ch2, 2dc), dc in each dc up to the last dc before ch sp, ch 1. Join with sl st in third ch. Rnd 15: Sl st in 2 dc, sl st in ch sp. Ch 5 and dc in same space. Skip 4 dc, (3dc, ch1, 3dc) in ch sp, skip 4 dc, (dc, ch2, dc) in ch sp, skip 4 dc, (3dc, ch1, 3dc) in ch sp, ch 1, skip 2 dc, dc in each dc up to the ch sp, in ch sp work (2dc, ch2, 2dc), dc in each dc up to last dc before ch sp, ch 2. Repeat the following for the round: skip 4 dc, (dc, ch2, dc) in ch sp, skip 4 dc, (3dc, ch1, 3dc) in ch sp, skip 4 dc, (dc, ch2, dc) in ch sp, skip 4 dc, (3dc, ch1, 3dc) in ch sp, ch 1, skip 2 dc, dc in each dc up to the ch sp, in ch sp work (2dc, ch2, 2dc), dc in each dc up to the last dc before ch sp, ch 2. Join with sl st in third ch. Repeat rounds 14 and 15 until blanket is desired size. On every 8th round (round 16, 24, etc.) work (3dc, ch2, 3dc) in each of the six points. This adjustment will help keep the blanket flat. Rnds 16, 24 etc. : Sl st in ch sp. Ch 3 and 2dc, ch1, 3dc in same space. Skip 4 dc, (dc, ch2, dc) in ch sp, skip 4 dc, (3dc, ch1, 3dc) in ch sp, skip 4 dc, (dc, ch2, dc) in ch sp, ch 2, skip 4 dc, dc in each dc up to the ch sp, in ch sp work (3dc, ch2, 3dc), dc in each dc up to the last dc before ch sp, ch 1. Repeat the following for the round: skip 2 dc, (3dc, ch1, 3dc) in ch sp, skip 4 dc, (dc, ch2, dc) in ch sp, skip 4 dc, (3dc, ch1, 3dc) in ch sp, skip 4 dc, (dc, ch2, dc) in ch sp, ch 2, skip 4 dc, dc in each dc up to the ch sp, in ch sp work (3dc, ch2, 3dc), dc in each dc up to the last dc before ch sp, ch 1. Join with sl st in third ch. just came across this pattern and decided to try it already! I got stuck on round 10 where it says “skip 4 dc, in space between dc work (dc, cdc), h2, ch1″ could you please explain what the cdc and h2 are? I can’t really figure out what that means I should do? Thanks!! Wow! Thank you. You caught some bad editing that happens with my sticky mouse sometimes. It should read “skip 4 dc, in space between dc work (dc, ch2, dc), ch1.” which I’m sure will make much more sense. I’ve fixed it in the pattern. Thanks for letting me know and sorry that was like that and made you have to pause on the blanket. I’m so excited you are making one. Thanks so much for the help!! Loving the blanket already!! I seem to be stuck in the same place! On row 10 after the 4th “skip 4dc,” I’m at the ch2 space in the 3rd V-st, not really “between 2dc” as in earlier rounds. I’ve tried going on from there, but my st count is just not correct. I’m hoping you can help me understand how this row goes. AHA – my mistake was on round 9! Now I’m OK. Thanks. This blanket is beautiful. Thank you for sharing your patterns. Your directions are well written and easy to follow. Beautiful! Round afghans are my favorite and this one is super. Hello! This is a beautiful pattern! What are the instructions for round 16? Round 16 is a repeat of round 14. For all the rounds after 15, repeat round 14 for even rounds and round 15 for odd rounds. I love your circle pattern and am working on it now. I am looking door a pattern to crochet Pippy Longstockings doll for my great granddaughter. Do you by any chance know where I can find it? What a beautiful pattern. I’m a leftie, so I’m gonna give it a try for my next project! Another gorgeous one that intrigues with different combos of stitches. I’m compiling quite a list. Need to watch for yarn sales! Thanks so much for the pattern for the blanket. Could you please tell me if you are using the American or English terms in regards to treble/double crochet. American. Double crochet = wrap yarn once, insert needle and pull up a loop. Pull through two loops, pull through two loops. Treble crochet = wrap yarn twice, insert needle and pull up a loop. Pull through two loops three times. This pattern is something I’ve been looking for as I am making as many afghans as possible for a crippled childrens hospital here in Okla.City in memory of our daughter we lost to ovarian cancer.My problem right now is my printer is acting up and I can”t get the pattern printed and I”ve really wanted it and a good ripple pattern to add to the afghans I”m making.There are 120 children there from newborns to 17 years of age.This has me at a place I don”t like to be.Thank you for the pattern even if I can”t get it Mrs. Parnell. Thanks for the beautiful pattern. I just made it in a chunky raspberry and trimmed with reverse sc, ch 1 around. I plan to use it a few more times! I would attach a pic but I am not sure how! Do you think this would be a good pattern for a lapghan – for nuns? I’ve done sc ripple afghans but not much else with crochet. Is this easy? I think this would make an excellent lapghan and is what I made mine for. I don’t think this pattern is difficult, but it could be a leap from doing sc ripples. I JUST PRINTED OUT YOUR WAFFLE IRON BABY AFGHAN, AND YOUR HAT PATTERNS, AND THE SHELL AND RIPPLE ROUND RIPPLE AFGHAN. I AM IN A CROCHET GROUP,WHICH WE NAMED THE (KRONUTS), AND I CROCHET AND KNIT WITH A GROUP AT THE LIBRARY. WE CROCHET AND KNIT FOR CHARITY GROUPS, SUCH AS BLANKETS FOR BABIES FOR UNWED MOTHERS, BATTERED WOMEN SHELTER, CLOTHING BANK, VETERANS, ETC. I HAVE BEEN CROCHETING SINCE I WAS 10 YEARS OLD, AND TAUGHT MYSELF TO KNIT WHEN I WAS LAID UP WITH THROMBOPHLEBITIS IN MY RIGHT LEG, IN 1974. I LOVE ALL OF YOUR PATTERNS AND IN TEND TO MAKE MORE OF THEM. KEEP THEM COMING. I was thinking of doing this in thread. I’m not sure of the needle size to use. Maybe a 6 or 7. Wow! I’d love to see how it looks in thread. Whatever needle size seems to work well with your thread weight. Around row 8 I start to have a curl, any suggestions? It may settle down after a few more rounds. If it does curl some when finished, wetting and drying flat should easily fix it. It’s necessary to start this post with the fact of how lovely the blanket is my only concern as a mother and grandmother is how lacey it is, this is just begging for little fingers and toes to get caught and hurt…please understand I am concerned on a safety level the design is so lovely ……. On this round you will be making stitches in the spaces between dc stitches instead of the top loops. I found a video that demonstrates the technique. Skip 2 dc, (dc, ch1, dc) in space between dc, skip 2 dc, 2dc in space between dc, skip 2 dc, (dc, ch1, dc)…. So you will be working in the space between dc stitches skipping every other space (two dc stitches between each space you work in). What you put in the space alternates between (dc, ch1, dc) and 2dc. You will do this all the way around to the beginning. Hi. Is there a printable version somewhere? At the top of the pattern is a printer icon. Use that to produce a clean printable version of the pattern. I’ll be glad to help. What part of the round are you stuck on? After completing round 8 you will have 12 v-stitches that are alternating with 12 shells. For the rest of the blanket, these will be divided into 6 panels with 2 v-stitches and 2 shells each. V-stitches are worked in shells of the prior round, and shells are worked into v-stitches, so that the positions swap from round to round. On round 9 you will begin the ripple panels. From this point on, the v-stitch/shell panels will be the same size on every round, but the ripple panels will increase. There are no chains between v-stitches and shells, so to begin each of these 6 ripple panels on round 9, you will put their first two dc in the space between the last dc of a v-stitch and the first dc of a shell. You will make a v-stitch, shell, v-stitch, shell, then you will do the (ch 1, 2 dc, ch2 ) that begins the ripple panel. You will work these two dc in the space between the v-stitch that you just made a shell in and the next shell, which you will then make a v-stitch in. I’d love to post a picture of it on the blog if you would not mind. I will send you an e-mail with my address. Here is a basic tutorial on crocheting between stitches. Let me know if this still doesn’t help. wondering if in the pattern rows 1-12 if instead of skipping 4 shouldn’t it say skip three each time? The 4 skipped are the one of the one side of the v-stitch and the 3 of the one side of the shell. My problem with round 11 might be from my not understanding in round 10 how to chain 1 in a space? Put in the crochet hook in the space, but trying to then chain 1 seems to end up being a slip stitch… is that correct? completely confused But absolutely love this pattern though, thanks for sharing! I’m so sorry that was confusing. The chains are just made as usual, with only the dc stitches on either side of them worked into the indicated chain space. The chains are included in the directions since the other stitches in the parentheses are worked into the same chain space. Thank you for your quick reply Mama! so if I understand correctly in round 111, when you say ” in ch sp work (2dc, ch2, 2dc), ch 2″, you’re telling me to crochet 2 dc, ch2, 2 dc AND to chain 2? Then my only question is for round 10: “in space between dc work (dc, ch2, dc), ch 1″ same instructions? I should DO a dc, ch2, dc AND a ch 1? thanks so much.. can’t wait to get back to this project! Yes. Everything you said is correct. Perfect, now it works, thank you! i often ‘convert’ patterns to other uses, tablecloths, doilies, enlarge on a baby blanket pattern to make afghan, etc. going to try this as a table topper, WHEN i get time. I just finished this pattern. I love it! Very easy to follow and quick to finish.I’m actually starting a second one now. Wish I could upload a photo. We hope to add a feature in the future to facilitate uploading pictures of finished projects. Until then, I can post them if you’d like along with any comments you’d like to include. E-mail to mama at thetucker dot com. I don’t understand why you add doubles at the peak every 8 rows. I find it makes it ripple more. I may put one LESS every 6 rows to see if that rectifies itself. How do you feel??? Everyone crochets a bit differently, so I can definitely see how it would behave differently for you. I’m glad this is a type of pattern that is easy to adjust in the peaks. Thank you. I have been waiting for a lovely baby circular blanket for the hospital. THANK YOU for this pattern!!!! I make afghans and donate them to my local children’s hospital. The children get to take their blankies home when they go and I’m always on the lookout for new patterns to use as I get tired of doing the same thing over and over. This pattern will get LOTS of use!! Thanks again and God bless you and your creativity!! Have you ever made this round ripple without going into the panels. Would love the pattern without the panels. Would look like a big flower. Such an interesting blanket! I’m curious as to it’s final shape. In some of the pictures it looks like the top half of the blanket is not as long as the bottom half, and most star-like blankets come out equal on the sides — as if they would fit in a square — but to me this blanket looks as if it would be more of a rectangle. I hope that makes sense. I can’t help but wonder if it’s just me because nobody mentioned it’s shape, but I would have considered that worth noting. The points come out an equal distance from the center, so in that sense it is round. It basically has a six-pointed star shape. I just LOVE all the patterns you post. I have a closet full of yarn (seriously!) and I can’t wait to start making some with the patterns you so generously share with us. I can’t wait to start this one. I’ve been doing mile a minute and granny squares, so this one will be a refreshing change for me. 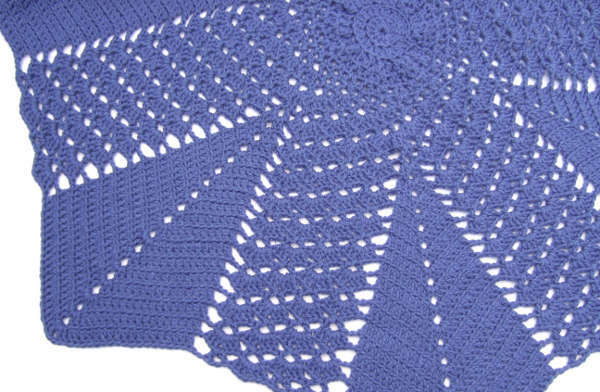 The basic pattern of the blanket is that you will continue the alternating shell and v-stitch pattern in the lacy panel. In the solid panels, you will always skip the first and last dc of the prior round and make dc in all the other dc and in the chains at the “peak” you will work either a (2dc, ch2, 2dc) shell or (3dc, ch2, 3dc) shell. So the dc that are skipped are 1 from the solid panel and either 1 or 3 from the lace panel depending if you are working in a v-stitch or a shell. If that doesn’t help, please let me know. HI I AM DAVID BACON LET YOU KNOW I AM DEAF AND CEREBRAL PALSY IN MY WHEELCHAIR… I LIKE TO ASK YOU HOW MANY SKEINS I HAVE TO MAKE SHELL AND V-STITCH ROUND RIPPLE BLANKET??? IDONT KNOW HOW TO DO WITH MATH PROBLEM LIKE THIS PATTERN… PLEASE EMAIL TO ME AND EXPLAIN ME VERY CLEAR PLEASE ??? I AM FORWARD TO HEAR FROM YOU!!!!!! !SMILE! Let me know the yardage of the skeins or at least the brand and name of the yarn so that I can look it up and let me know how wide you want your finished blanket and I’ll be glad to make that calculation for you. JUST CAME ACROSS THIS ROUND RIPPLE BLANKET PATTERN AND I AM GOING TO MAKE IT IN BURGUNDY. CAN THIS PATTERN BE USED AS A TABLE CLOTH? I just wanted to let you know that I am using some of your patterns for my shop, StarryCrochet. On that note, thank you so very much for sharing such wonderful patterns! Mama. I have yet to try this pattern but trust me I WILL. I love this type of design as they’re very unique. However the reason I wrote this is i like the Fact that you keep In touch with the problem each crocheting valiants problems. Your are so astute and so eager to help others. I am so very impressed and happy to see this in a pattern . 2012/07/28/shell-and-v-stitch-round-ripple-blanket — which round (14 and 15 as even numbers) for the 7th round, because you stated every 8th round is 16, 24, 32, 40, 48, 56, 64, 72, and 80? how can i work with seventh round?? ?